Indonesia’s laws related to national forests are confused. I need to do more homework around this, but my understanding is that under conservation law humans aren’t allowed to live in national parks, while under human rights law, indigenous communities are allowed to use national park land in ways that maintain their customs and traditions. One of the customs and traditions of Orang Rimba is clearing patches of forest to plant subsistence crops such as cassava. But does that extend to clearing forest to plant a cash crop such as rubber? Does a tradition from the era of the axe hold in the era of the chainsaw? 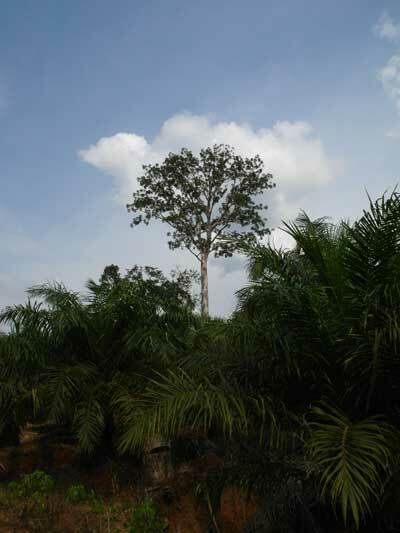 The bulk of the deforestation comes not from Orang Rimba themselves but from people who clear land in large quantities and and parcel it up to sell to smallholders who want to plug in to the commodity boom that is fertilising the rococo mansions that now sprout around plantation areas. I rode for an hour on Gentar’s motorbike from the place where the original 2004 National Park boundary marker used to be (it has now disappeared) to the first sign of any primary forest. The last few hundred yards were littered with the skeletons of trees that had been felled in the previous few days. In four days in and around the park I did not see any indication that the National Park was being protected in any way. No forestry patrols, no rangers, no boundary markers, not even any of those futile “Clearing of land prohibited” signs. Also, no bees. For those interested in the challenges faced by ancient hunter-gatherer cultures seduced and/or assaulted by modernity, I recommend Butet Manurung’s The Jungle School, an account of her struggle with the notion (and practice) of educating Orang Rimba children. Including Gentar. 1 Comment on "A requiem for Indonesia’s national parks"